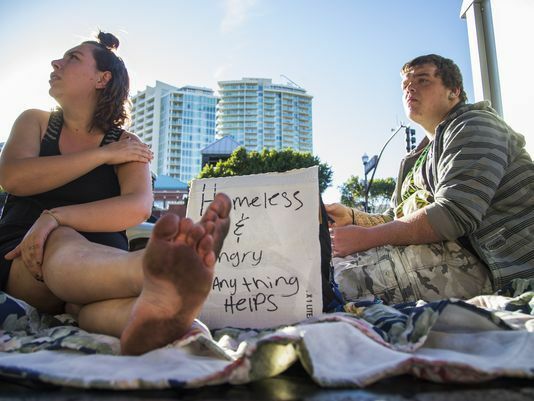 Vanessa Eley and Austin Webber, panhandling in downtown Tempe, might have a tougher time doing so under a new law. TEMPE — Tempe police will have new authority to discourage people from sitting on downtown sidewalks for extended periods after the City Council adopted an ordinance Thursday that targets what some see as a growing problem along Mill Avenue. Both backers and opponents of the new law agree more is needed to address the larger issue of homelessness in Tempe, but a majority of council members agreed the law would at least give police an enforcement tool. The council adopted the ordinance on a 5-2 vote after a public hearing Thursday where supporters complained that dozens of sidewalk-sitters who camp along Mill Avenue each day are hurting businesses and causing people to avoid downtown Tempe. Many of the sidewalk-sitters are homeless and in their teens or 20s. But critics countered the law, which could impose a $100 fine on violators, would target homeless people without providing any help. Councilwoman Lauren Kuby, who voted against the ordinance with Councilman Kolby Granville, said the city has laws to address things like littering, public urination or aggressive panhandling. “Is sitting on the sidewalk what we want to criminalize in our inclusive community?” she asked, suggesting the city should instead increase funding for social-service programs and agencies that provide outreach and explore ways to address chronic homelessness. “These are tougher discussions, I grant you. I know we can do better to find a solution to this issue,” she said at the meeting, fighting back tears. All of the council members agreed a broader approach is needed. “For me, it’s not the end. It’s not everything. I think we continue to work and do everything we can to help all the stakeholders,” said Councilwoman Robin Arredondo-Savage. The law applies to downtown Tempe and takes effect May 14. It makes it illegal to sit or lie on the sidewalk or on any object — such as a blanket or chair — that is not permanently affixed to the ground. It makes exceptions for a medical emergency or a person with a disability and people attending a lawful event such as a parade, festival, demonstration or event sponsored by a nearby business. City officials say police first will inform sidewalk-sitters about the law and ask them to move. If a person does not comply after a reasonable amount of time — at the discretion of police — officers could issue a ticket with a penalty of up to $100 for a first offense. The ordinance will be in effect from 7 a.m. to 10 p.m. Monday through Thursday and 7 a.m. to 2:30 a.m. Friday through Sunday. The ordinance specifies that a person cannot be cited simply for being homeless. Scott Price, owner of C.A.S.A Sunba restaurant and bar, read a letter on behalf of a group of downtown business owners supporting the ordinance. They also pledged to raise $100,000 in the next year for homeless-assistance efforts. Several residents spoke against the ordinance, suggesting it would allow the city to single out homeless people despite the wording in the law barring that. Tempe had a similar ordinance in place from 1999 to 2014. In 2014, the city attempted to apply the policy, which made it illegal to sit or lie on the sidewalks, throughout the city. That caused an outcry from residents.